Like other folk artists, early rugmakers created rug designs based on their houses, pets, farm animals and favorite landscapes. These rugs produced from original designs are generally considered the most charming as well as the most primitive. 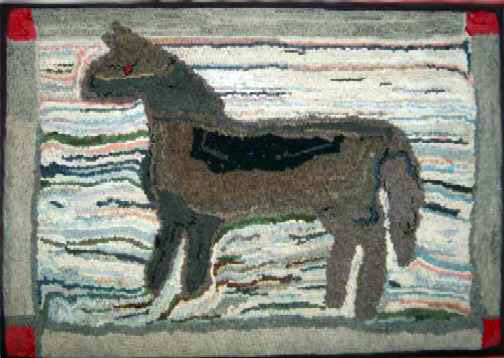 This rug with it's "hit or miss" background and its almost childlike perspective in the depiction of the horse is clearly a product of someone's imagination and a fine example of American Folk Art. The solid border, with its corner block squares imitate a design element typical of Victorian furniture and picture frames of the period. This is very helpful in dating the rug since many patterns were used over a long period of time. The colors are strong, the condition is excellent, and the rug is mounted on a stretcher, ready to hang. Size is 37-1/2" long and 26" high.